If you have recently become aware of a rodent infestation in your home, you are no doubt looking for a speedy and effective solution. None of us enjoys the thought of sharing our home with the furry little creatures that leave droppings on our floors or countertops, and nibble on our food supplies. Once you come to terms with this unpleasant reality, the next step will be to find the best way to eradicate the mice in your house. This is where you may find that sticky mouse traps could be the ideal solution to your sticky situation. The simple design of a mouse glue trap (also known as a glue board or glue trap) consists of a flat surface or tray which is coated with a very sticky substance. When the mouse touches the glue it is immediately trapped and effectively immobilized. There is no fuss or bother with elaborate contraptions which have to be set, or loaded. There is no chance of a mouse snatching a bait away without triggering the trap at all. All you need to do is position the sticky boards in strategic locations in your home and wait for the mice to be caught. In case you are wondering how the mice would be enticed to walk onto the adhesive substance, some glue traps come with a built in scent which smells like some delicious food that the mouse would be drawn towards; such as the peanut butter scented glue boards from Catchmaster. Alternatively, you can also choose to place a blob of peanut butter, or other baits in the center of the trap. Just don’t use too much, or they might be able to eat the bait without getting caught; a little goes a long way here. Glue traps are effective in high traffic areas; where mice like to run through often. The simplicity of the glue mouse trap means that there are no complicated mechanical devices or contraptions, making this one of the cheapest and most economical ways to go about trapping unwanted mice. In fact, it can also be effective in eliminating other vermin such as scorpions, spiders and even snakes. You may be pleasantly surprised at what you are able to catch with one simple sticky trap. These kind of mouse glue traps work best within the four walls of your home which is essentially where you want to eliminate the mice. Due to the nature of the exposed surface of the mouse trap glue, it does not respond well to outdoor elements such as moisture, humidity and dust; which may compromise the effectiveness. Make sure you place your glue trap in a sheltered area within your home where it can be discovered by the scampering feet of a trespassing mouse. Increase your catch rate by using both traps near each other. Maybe you have been waging war on your resident rodent for quite some time now without success. Yes, the mice of today can be extremely wily and wise, to the point of robbing conventional traps of bait without setting them off. Indeed, some mice will even jump right over a trap in their path! This is where a strategically placed sticky mouse traps can result in a sticky landing for the mouse and a successful capture for you. 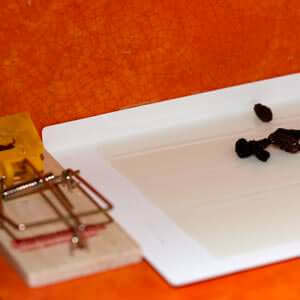 Place the glue trap next to another , and as the mouse jumps over, it will be stopped in its tracks by the glue trap. One of the best benefits of mouse sticky traps is their disposability. Once you have made your catch, all you need to do is throw both trap and the mouse in glue trap straight into the garbage can. I personally prefer to kill the mouse quickly with a blunt object, but the decision to do so is up to you. This easy and convenient cleanup aspect is definitely a bonus in this time-strapped day and age. However, it may happen that when you discover your catch, the mouse may still be alive. This is not a pleasant prospect, but a quick, firm tap on the head with a heavy object will give you the satisfaction of a mission accomplished. If your intention is not to kill the mice but rather release them somewhere far from your home, then this may also be possible when using the glue trap. Although the original design and intention of this kind of trap is not for release, it can still be accomplished in some cases by using great care and some kind of lubricant such as vegetable oil or a dry powder like cornstarch. Make sure that you wear rubber gloves, coat the mouse with the oil or flour and carefully work it free, before releasing it at least five miles away from your home. However, this can be dangerous to you because there’s a high risk of being bitten by the trapped mouse. Once trapped, they’re going to panic and be under a lot of stress. Any animal placed into such a situation will likely attack anything that comes near. So, if you really want to release a mice alive, mouse sticky traps are probably not a good choice. Use a live capture trap like the Victor Tin Cat instead, or one of the other no-kill options listed here. The adhesives used in glue traps are made from natural or synthetic substances which are non-toxic to humans. This means you are not using any harmful chemicals or poisons and these traps can be safely placed around your home or at your work place, without affecting food or water. Another advantage of the mouse glue trap is that it effectively traps not only the mouse but also any mites which may be attached to its body. As the mites seek to leave the body of the mouse they will also be trapped in the glue, thus eliminating two pests at once. These traps can be especially suitable and practical in high risk environments, for example clinics or kitchens where infection and contamination needs to be eliminated as speedily as possible. 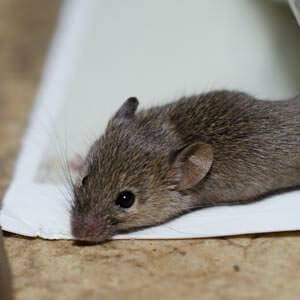 Glue mouse traps are ideal for smaller rodents and juveniles when used according to instructions. Traps should be placed in areas where the mice are most likely to run, along walls or skirting boards where there is evidence or pest activity. If you have pets in your home, remember to place the sticky traps out of their reach. If one of your pets inadvertently becomes stuck, apply some vegetable oil to the affected area until you can gently work the trap free. Sticky mouse traps are one of the easiest, quickest and most effective ways of keeping your home free of mice and other small pests. So if you are looking for a simple and convenient remedy to your mouse problem, you may just find that this sticky solution is your best option. But do keep in mind there are other ways to get rid of them; with other traps being some of the best options.